The power supply market is directly dependent on electronic systems market. Whether it is a simple dc/dc converter chip or a brick, power supply devices and systems are sold as part of other system or to power such system externally. If the electronics systems market grows, a quite close by growth can be seen in the power supply market. Market researcher IHS finds in 2013 power supply market has grown by a small percentage of 2.4%, it is near flat. However in 2014 , a power supply market growth estimation of 10% is realistic. The total global power supply market is estimated to reach little less than US$ 20 Billion in 2014. The AC/DC market is also driven by smartphones which USB port power adapters. The power supply adapter market in India is within US$ 1Billion, but is one of the fastest growing market with growth rate in the range of 25-30% in 2014. Higher effeciency and small size is the design trend and less EMI is an important factor in noise sensitive medical and other such heavy sensor-integrated electronics systems. Taiwan based Delta electronics is number one in this market, Emerson, lite-On are ranked next top 2 vendors as rates by IHS. 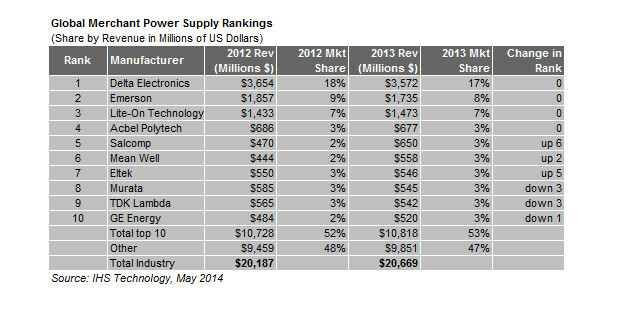 Below are the top 10 vendors of power supply ranking based on revenue. Belows are the expert comments on the power electronics market both in India and world by Sapna Mongia, Technical Marketing Head, STMicroelectronics. Sapna Mongia: The ever-increasing demand for electricity is driving developments in the power domain to optimize energy generation, distribution, and management. The Smart Grid aims to optimize a utility’s electric distribution network by monitoring, communicating, and increasing consumer awareness of usage while Smart energy meters, Solar inverters, solar charge controller, solar LED lights, digital power supply are creating innovation in the global power market.Meanwhile, applications with smart-power features ensure that those applications operate as efficiently as possible. The Semiconductor industry is developing products which are helping the power sector in generation and distribution of power through Smart Grid and Smart Metering solutions. Consumers are benefiting from products like LED lights (low cost high efficiency), higher efficiency gadget chargers with much lower standby power and higher efficiency domestic equipment that can operate more efficiently and therefore don’t need to consume as much energy. And in the Industrial segment, semiconductors offer better and more efficient HVAC, motor drives, and industrial control systems. Efficient energy generation, distribution, conversion and consumption are all critical components in meeting our growing energy needs. In addition to performance and cost, power consumption has become an important factor in benchmarking an IC design. Also power awareness levels are escalating and the semiconductor industry’s involvement in reducing global energy consumption has turned out to be progressively more significant. Sapna Mongia: As in other markets, India is moving to more efficient and reliable power systems with the use of more efficient power inverters, solar charge controller, LED lighting, induction cooking, Brushless-motor Direct Current ceiling fans, power supplies for set-top box, metering systems, and communication modules for smart energy meters. There are enormous opportunities in both existing and emerging applications. For instance, we believe the smart grid will benefit the Indian power sector on many levels. The technology optimizes power delivery and facilitates two-way communication across the grid, enabling end-user energy management, minimizing power disruptions and transporting only the required amount of power. The result better balances power demand through the day, lowers costs for the utility and the customer, and ensures more reliable power and reduced carbon emissions. This is precisely what ST is working toward.